This form will be in two volumes due to its complicated way and the need to teach it in great detail slowly. The 'Still' Form or 'Form of Stillness' This is the 10th in the series of Qi Disruption or 'WUDANG SHAN' system tapes. It is called 'Still' because this is the first form that deals totally with Qi development and use. 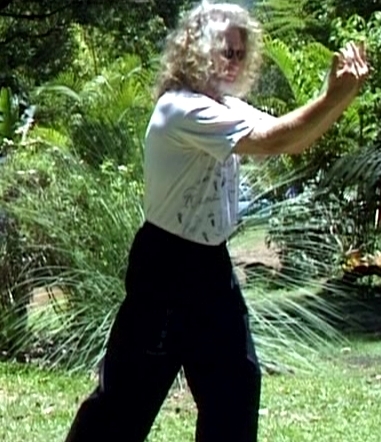 In this form we see the beginning of Taijiquan as we now have a few explosive movements (fa-jing) as well as a slowing down of the form postures. This is because we are trying to concentrate a large amount of Qi down into a fine line for use either in healing or in the fighting arts. If for instance you take a 12 inch pipe through which a volume of water is flowing, you might be able to stand in front of it and take a shower. However, if you were to then force that flow at the same rate to flow through a ½ inch pipe, it would cut you in two! Or like when we go out in to the light of day, it is pleasant but when that very same light is concentrated down into a laser light is can cut you and drill holes in you and other things.